You may or may not have heard of Burning Man, growing up in the SF Bay Area I’ve known about it and suspected I would end up there since middle school. Most people think of Burning Man as a giant RAVE in the desert, like Coachella (only cheaper than Coachella and it lasts a week instead of four days). But Burning Man is so much more. You could spend all week out there and listen only to live music or at least not electronic, or even no music at all. There is a TEDx out there as well as the Palenque Norte lecture series and countless other talks and classes on nearly every topic you can think of. Simply put, there is something for everyone of all ages in that desert, from the very young to the very old. There are art cars, vehicles of all sorts transformed into living art projects. 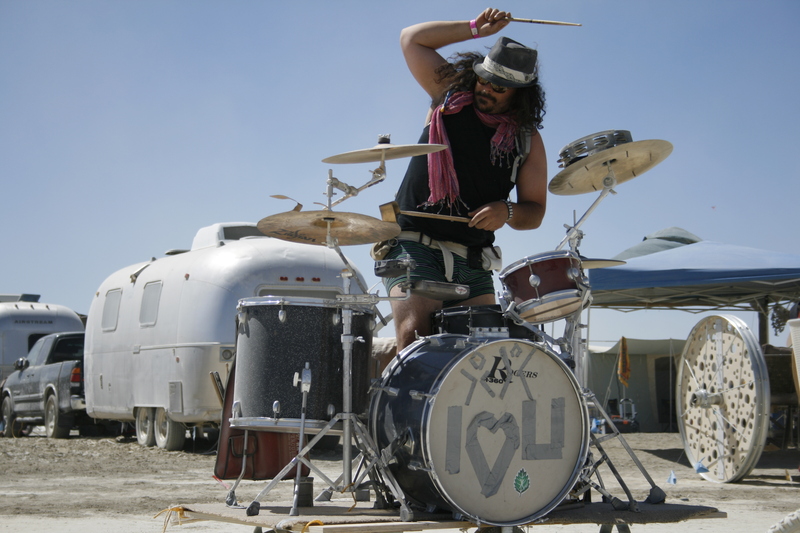 While music primarily is electronic there was still live music to be had, namely this badass drummer. 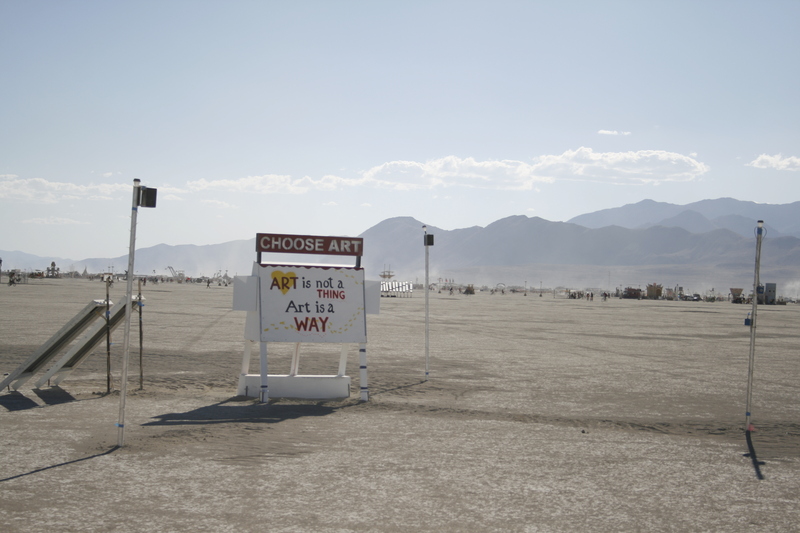 Along with music Burning Man is riddled with philosophy and thought provoking works of art. And at the end of the week everything burns, even the Temple. 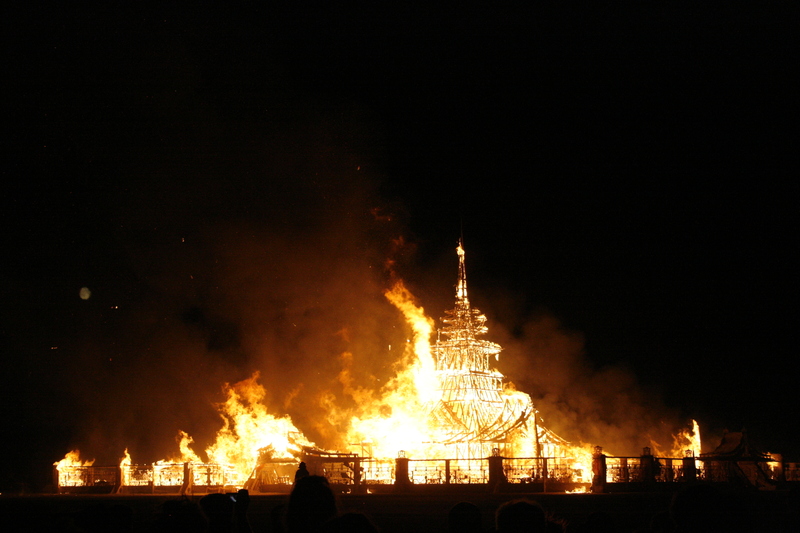 One thing I have learned from years of researching Burning Man it is that no one knows exactly how or why it was started, either that or people know and are unwilling to come to a consensus on the facts. This has left the event’s origin shrouded in rumor with an elaborate mythology. Stories range from the tragic death of a friend or pet, to an explosive divorce with an awful wife, to the mundane desire to just burn a man on the beach. I’ve developed my own theory about the roots of Burning Man, and choice of current location. I call it a theory but it is meant more as a humorous observation, rather than something taken with the weight of actual science, and it meant to be seen as inclusive (not mutually exclusive) with all other theories. You may call this the Dune Origin Myth for the starting of Burning Man. If my first post didn’t make it clear I love Dune, the David Lynch movie not the book. I have not read the book yet, which I’ll admit is a failure on my part because books are awesome. In Dune, there are several planets, including Caladan and Arrakis; I will only be discussing these two as the only relevant ones to this post, as well as a small bit of the plot without spoiling anything. The main characters, the royal family of Duke Leto Atreides, live on Caladan, a planet covered in a vast ocean. They are instructed by the Emperor of the Known Universe to go to Arrakis to take control of the spice mining operations. Arrakis is also known as Dune, it is a dry desert planet where nothing grows and there is no life other than giant sandworms and the hardy Fremen people. The only thing of value on Dune is the spice Melange; this spice is vital to space travel and expands consciousness. Over years of using the spice people can evolve to be more than human, as is evidenced by the Spacing Guild navigators. Now that you know the relevant literary context let me address how this applies to the founding of Burning Man. I was born in San Francisco, and the furthest I have ever lived from there is Santa Cruz; being a lifetime Bay Area resident the ocean is the salt in my blood. Burning Man was started by Bay Area residents, artists and crafters, as well as a fair few jolly pranksters, in my hometown of San Francisco. In a quick four years, it grew too big to be housed on Baker Beach in SF and they had to find somewhere new to burn a Man. They found the Black Rock Desert, a geographic feature known as a playa, which coincidentally is Spanish for beach. Burning Man had now found a beach big enough to hold countless many more free spirits and pleasure seekers. 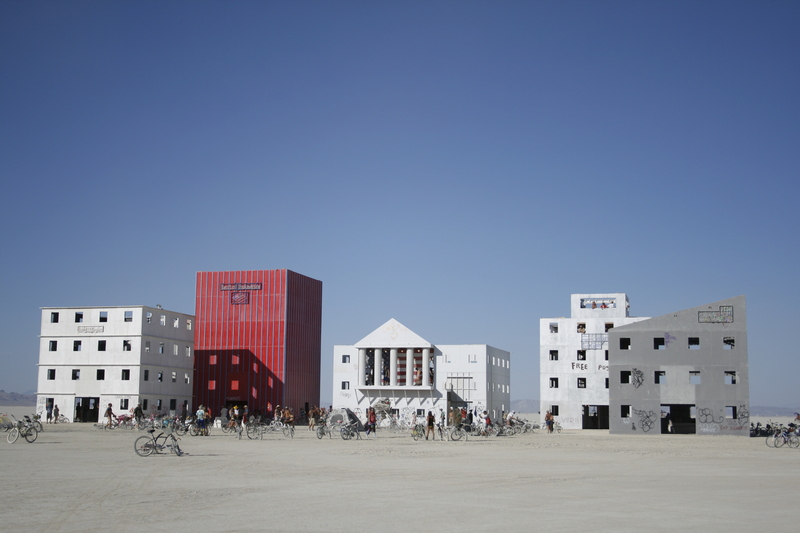 Thanks to help from John Law of the now mostly-defunct SF Cacophony Society, the 1990 Burn was moved to the Black Rock desert, where the virgin BMORG effectively co-opted the Cacophony Society’s Zone Trip #4: A Bad Day at Black Rock making it the first Burning Man. I use the term co-opted rather lightly here, Larry Harvey and Jerry James were invited by John Law and Michael Mikel of Cacophony to come along to burn their Man. The co-opting happens in history where the event is solely remembered for being the first Burning Man in the Black Rock Desert, part of this posting is keeping the history of Cacophony alive in the wake of a dominant countercultural force like Burning Man. History is written by the conquerors, even the history of counterculture movements. I guess you could say I have a soft spot for Cacophony. Like the Atreides family these brave adventurers embarked on a grand pilgrimage to a place they had never gone before, a place radically different than the world they were leaving behind. Duke Leto comforted his son with some sage advice before they set out for Dune, “A person needs new experiences … Without change something sleeps inside us and seldom awakens. The sleeper must awaken.” Larry Havery also recognized the vast potential for change out there in the desert, “I drew a line on the ground, and I said on the other side of this line everything will be different. And everything has been different.” On the other side of the line is a desert and deserted world, void of plants and animal life, a place of nothing but dust. In Dune the spice is said to be in everything on the planet, to permeate all life there, just like the dust in the Black Rock Desert saturates all things brought onto its alkaline expanse. While in Dune it was a spice-dust that expanded consciousness for us Burners in the Playa there isn’t anything spicy about it, though it is alkaline. Despite Burning Man being a global phenomenon, according to 2011 census over half of Burners still came from California with over a third from Northern California. While we are beginning to see more participation from inland areas as Burner culture permeates deeper into humanity’s collective conscious, it remains primarily an activity of us coastdwellers. 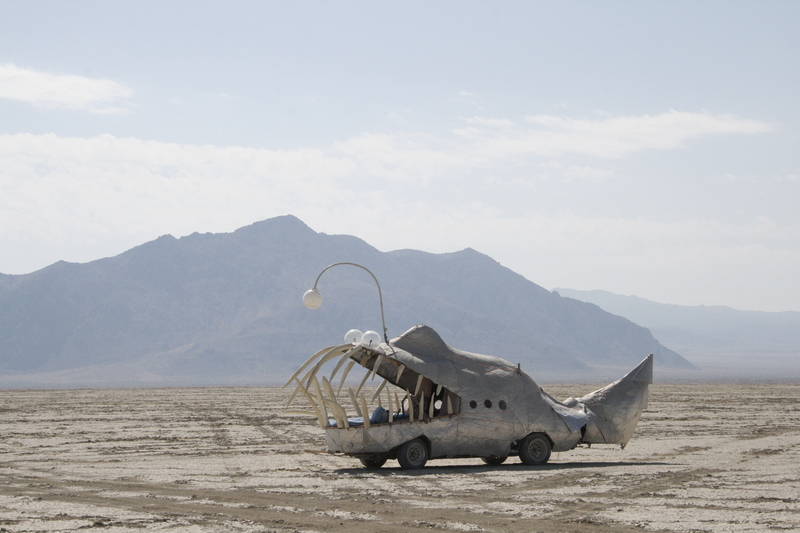 Like Arrakis in Dune, Burning Man exists as a context where ocean people, or put broader people that are not of the desert, can go to the desert and learn how to survive out there in its harsh and unique climate. Whether you go to Burning Man as a survivalist, you will leave the Burn as a survivalist. This event trains you to survive in one of the harshest environments out there, which for me is part of the appeal; testing my limits to further my personal growth. The great thing about the Burn is that there is something for everyone, no matter your age or personal background; nothing is forced on you and nearly anything is permitted that doesn’t violate relevant state or federal laws. It is a blank canvass for each individual to paint their masterwork, before burning it away and starting fresh.